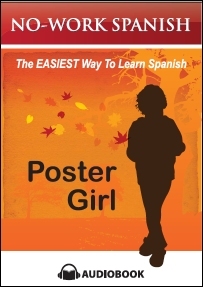 Have you ever wanted to learn Spanish, but didn't have the time to take classes? If so, No Work Spanish may be the answer for you! No Work Spanish is a new approach to learning another language. You learn just like you did your first language, by listening to others speak it. 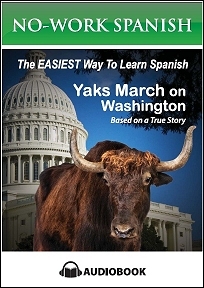 Yaks March on Washington: This is a true story about the experiences of an Idaho rancher who travels across the country with his trusty dog, and six yaks in tow. Poster Girl: a two-CD story about trying to outdo a goody two-shoes student and problems that happen when you start your school project the night before it is due. I remember some Spanish from high school, but only key words and phrases. Hey, it's been a long while, lol! I wasn't sure just listening to these CDs would help, but it really does. After listening to only a few sentences I found myself understanding words and sometimes a sentence. It's taking my fourteen year old son a little longer to pick out words, but I think with time he will get it. I am thinking of going here and printing out the text for these No Work Spanish stories, so he can follow along. If you would like to try No Work Spanish, you can go here and they will email you the first three chapters of one of their books. Then you can see for yourself how easy it is. You can purchase both of the Spanish audio CDs that I received for $21.95. They are also available as an audio download and prices will vary with which one you would like to buy. I received No Work Spanish through Mama Bzz in exchange for an honest review. I recently met and made friends with 2 Hispanic couples. The wives speak fluent English but it would be nice to freshen up my Spanish from high school. I want to wish you a very blessed Mother's Day Nancy. 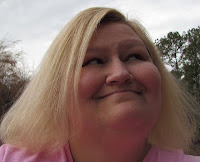 You are a great Mom and are blessed with two wonderful sons.